Springs Fire in Pt Mugu State Park. 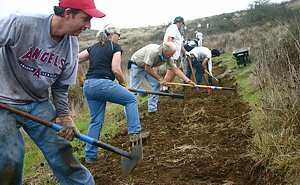 The next trail repair date is June 8th - Come out and help! The L.A. Weekly has listed Jennifer Klausner in their People 2013 issue, a list is of "fascinating Angelenos" posted online on May 15, 2013. Among them are community advocates, artists, athletes, entrepreneurs and others with a variety of backgrounds who have helped make Los Angeles a better, and more interesting, place to live. 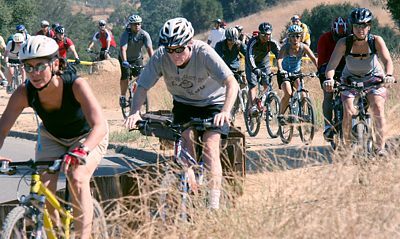 Klausner is recognized for her legacy of work as an advocate for cycling, especially through her role as Executive Director at the Los Angeles County Bicycle Coalition and how she got there. 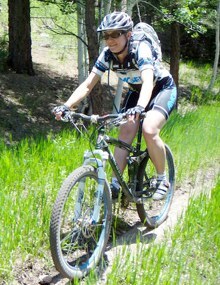 Though most of these accomplishments are for road and urban cycling, she is continuing to build her legacy in off-road cycling as a member of CORBA’s Board of Directors. We congratulate Jennifer on the recognition, thank her for all her past and ongoing work on behalf of the cycling community, and are very happy to have her serving on CORBA’s all-volunteer Board. The story is posted on LA Weekly’s web site or here. 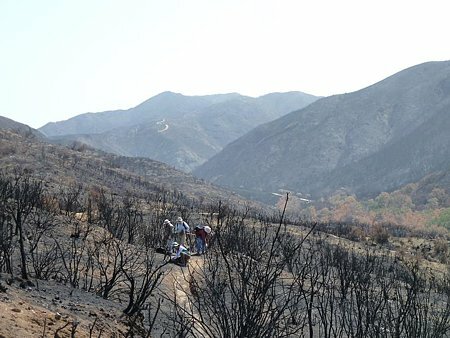 June 8: Springs Fire Trail Repair in Pt Mugu State Park. 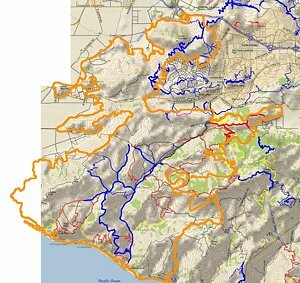 Join CORBA, the Santa Monica Mountains Trails Council and others as we repair the trail damage caused by the recent Springs Fire. Initial efforts will focus on removing debris from the trails (fallen trees, rocks, small landslides, etc) so they can be safely used by park visitors. Later work will involve repairing drainage so that rainwater running off the denuded hillsides will not wash the trails away. For details and to register so we'll know how many to prepare for, see our online registration page on Meetup.com. From May 21, 2013: Twice in the past week at the request of the State Parks trails maintenance department, a group of about 8 volunteers from the Santa Monica Mountains Trails Council headed into Point Mugu State Park to begin cleanup and repair of the trails after the Springs Fire swept through just over a week earlier. This work was undertaken before the park is open to the general public to help assess the situation, clear and repair trails to make them safe for park visitors, and to limit damage to the fragile web of wildlife that survived the fire. The initial focus will be to protect park resources and make them safe for visitors. When that is complete, we’ll concentrate on repairing the drainage so rainwater that runs down the denuded hillsides doesn’t wash the trails away this winter. It was eerie on the trail itself. 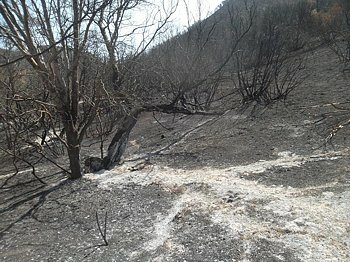 The fire seems to have burned about 10 feet up from the ground so the leaves are stripped off of the chaparral, but taller oaks and sycamores still have leaves in various states of scorched to dead. Being able to see through the leafless chaparral, we discover that there’s a lot of junk lying on the ground near the trail, including a metal windmill that must have fallen over years ago.The tread of the trail was in good shape. The leaves from the overhead trees that normally carpet it were all gone so we were walking on bare dirt. Unfortunately many of the oaks near the bottom of the trail had burned through the trunk and fallen over. Four or five of them blocked the trail and we spent considerable time cutting them up with a chainsaw and hand saws into pieces small enough for us to drag off the trail. We are now excepting sponsors/supports including more demo bikes for the GGR Rocktober 20th annual event! It is FREE for sponsors to attend in lieu of product donation! Email wendy@girlzgoneriding.com for details. The Rocktober event is also a CORBA fund raiser and a CORBA Membership drive! ½ of the proceeds from the raffles and silent auctions get donated to CORBA. Registration will go up in September & will include the membership/renewal drive. Saturday June 1 is the next skills clinic.